There’s an app for everything these days, and I’ll be the first to confess my kids are better at using most of them than I am! 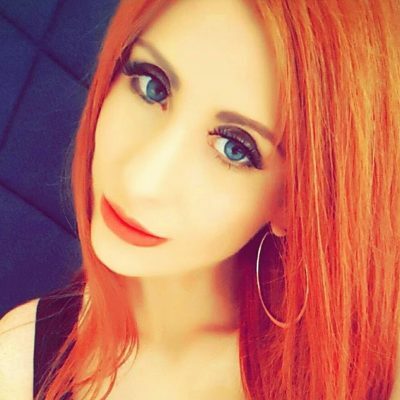 It’s actually pretty mind-blowing when you consider that 95% of under 5s now have access to a mobile device, and with stats like those, it’s little wonder that more and more of my mummy m8s are raising concerns about the safety and quality of the content their kids are accessing online. If you’re in the same boat, then I’m going to tell you exactly what I’ve been telling them – try the new Wiggles app! My daughter Evie convinced me to download The Wiggles – Fun Time with Faces just after it launched in October (there was a free two-week trial so the whole “we can’t afford it” excuse just wasn’t going to fly). Now, my kids are both obsessed and it’s made my life a whole lot easier too! How? Why? Well, here’s a few reasons. One of the biggest challenges of parenting is regulating the amount of screen time that our kids are exposed to. Nobody wants to end up with an antisocial zombie child with a kinked neck and a vitamin D deficiency, and with so much absolute junk exploding at our youngsters out of these devices, it’s equally as challenging for us as parents to ensure that the screen time they do have is meaningful and stimulating. That’s one reason my kids and I love the new Wiggles App. The Wiggles – Fun Time with Faces uses first-of-its-kind interactive video technology and augmented reality 3D masks to engage kids’ imaginations and creativity as they play, helping their young minds develop while keeping them thoroughly entertained! Welcome to the exciting new world of augmented reality! It may sound like something out of a sci-fi movie but this groundbreaking technological development is a super fun and easy way for your littlies to immerse themselves in the Wiggles World like never before! Using adorable AR face masks and filters, kiddies can actually become Dorothy the Dinosaur and more of their fave Wiggly characters, plus star in their own unique interactive stories narrated by the delightful Yellow Wiggle Emma, and film themselves singing along to their favourite Wiggles songs — all in real time! 3. Hours & Hours Of Fun! With four different in-app “fun houses” to explore, your littles will be entertained for hours on end! Next, the ‘Fun Time with Stories’ house brings a ‘learn-through-play’ immersive experience, narrated by Emma Wiggle. In this one, kids can become their fave Wiggly characters — including Wags the Dog, Dorothy Dinosaur and Henry the Octopus — with Animoji-style 3D masks. Your gal Emma then guides them on an interactive journey using songs, language and structured play — all centred around their chosen character! Thirdly, the ‘Play Time with Faces’ house is like a digital sandbox where kids can express themselves in their own way with “free play”, trying on a selection of 2D masks (3D options on iPhone X). There are no rules and no time limits in this mode, with your littles free to create and play however they want! Finally, the ‘Fun Time with Videos’ house is where the young’ns can stream their favourite video clips by The Wiggles directly to their devices. Sure, this app can keep the tots occupied with safe, age-appropriate content for hours on end, but that doesn’t mean it’s only able to be enjoyed in solo mode! Some of the biggest LOLs we’ve had have been when we’ve all been sitting around together having a go at singing along to ‘Hot Potato’ using all the cute AR face masks. Evie couldn’t stop laughing, especially when Mum kept forgetting the words!! Well, this is more about us than them, but it’s still an important one. 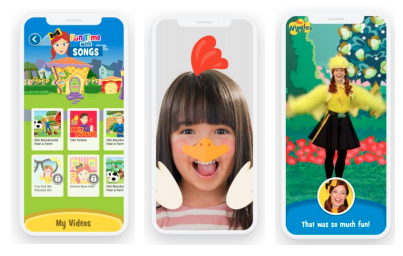 The Wiggles App delivers 100% safe content, developed by a trio of trusted Aussie brands – homegrown tech start-up, Weyo, the ABC and, of course, The Wiggles themselves. Fully compliant with COPPA (The Children’s Online Privacy Protection Act) and GDPR (General Data Protection Regulation), the app also protects kids’ privacy, with no user data collected or saved on the app’s servers. So, in short, while the kids are enjoying hours of safe, engaging and interactive fun, you can put your feet up and relax knowing they’re in Wiggly good hands! 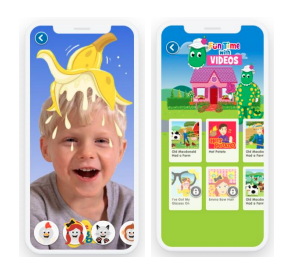 ‘The Wiggles – Fun Time with Faces’ app is free to download and try for two weeks (with full content access), and reduced content is still available free after the trial has ended. Then, to access full and exclusive content, a monthly subscription fee of $1.99 per month is offered (opt-out anytime), or a discounted yearly fee of $19.99 per year. ‘The Wiggles – Fun Time with Faces’ app is available now via be Apple’s app store.